Word unscrambler Software, help you unscramble words and letters in anagrams. Don't you just hate when you can't solve that "word jumble" puzzle in the daily newspaper? or when your teacher just offered you extra credit if only you could figure out what word some set of letters represented before they were scrambled into random order. There is a list of programs that will descramble a scrambled word, just enter your letters, and you will see what words are in the dictionary that use those letters. 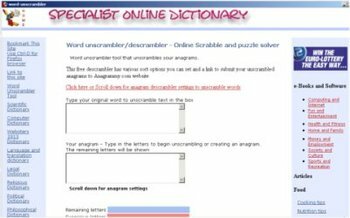 Word unscrambler tool with dictionary page and anagram solver program to help you unscramble words and letters in anagrams. Zach has a very large bank of recognizable words (but obviously not all conceivable words). At current count, there are nearly 130,000 words. It also will accept a wild card character... If you want one of the letters to be a wild card (could be any letter), enter a * (star key). Example) olel* gives you cello, hello, Jello, and losel. Unscrambler finds words from a set of scrambled letters by using a dictionary.